This is one of those pictures where the composition is everything and the subject is reduced to supporting the composition. I also added a strong contrast to make it look more like a graphic (it actually looks a lot like what we used to get from slide film). Wow- that's a wonderful abstract. Quite surreal! I'm still trying to figure out what the objects are....but as you say, that is secondary to your intent. The shadows contribute much the design here-such strong elements. So do the vibrant colors. Excellent work! P.S. I see now that it is a work of art/sculpture. Intriguing! 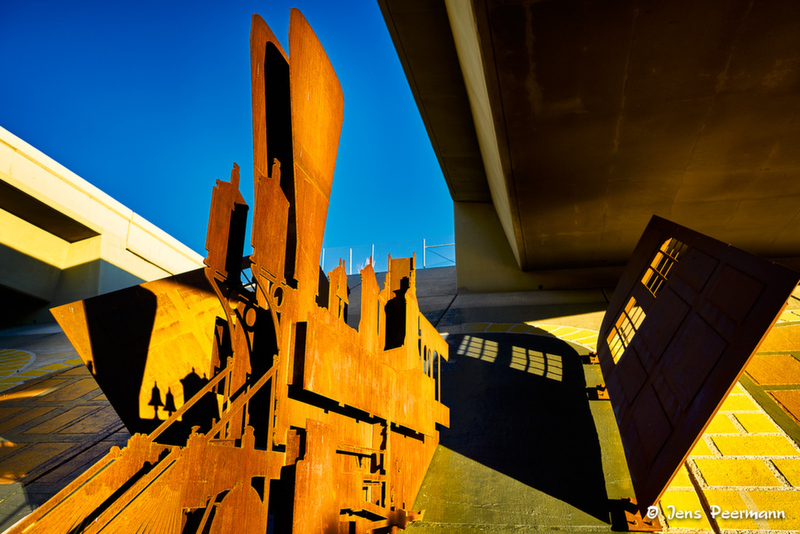 It is art at a freeway intersection, as it is becoming rather common now. This one depicts a steam engine coming out of the big door at the roundhouse. About half a mile from this spot there used to be the huge roundhouse where the maintenance for all engines and cars of the Vitginia & Truckee Railroad was done. So that became the theme for this intersection. A very striking, dynamic study in sharp shapes, lines, light and shadow. Well done!